The transit center also serves as the terminus for Metro Route 952, which runs to Auburn on a very limited schedule, and Sound Transit Express Route 513, which has been moved from a terminal on the north side of the Evergreen Way Interchange on State Route 526. Route 513 now also serves a single stop on Casino Road west of Evergreen Way, allowing for easier transfers to the Swift Blue Line, but sadly does not serve the cluster of apartment complexes along West Casino Road. Community Transit is also deploying double-decker buses on Routes 532 and 535 between Snohomish County and Bellevue, so keep your eyes peeled using a bus tracker of your choice. Sound Transit Express Route 540 is also joining the Community Transit family, having been handed over from Metro, presumably due to the need for more capacity on Route 550 under its the post-tunnel schedule. Route 510 is also gaining a set of southbound trips in the shoulder AM peak to extend service until 9:30 am. For Everett Transit, this week’s restructure can be best described as making the best out of a bad situation. Budget cuts are forcing hours to be cut, but the agency hopes to use the restructure as a springboard for a more efficient system that can grow out into a frequent local network. With the elimination of one-way circulator routes and a few per-trip deviations, the new network is also simpler to navigate and should be able to grow without undergoing even more drastic changes. Route 2: The circulator route is replaced with a bi-directional route that stays on 4th Avenue West and 7th Avenue Southeast. End-to-end trip times are about 31% faster for southbound riders and 5% faster northbound. 112th Street will, however, lose its service, and the route remains on 45-minute frequencies. Route 3: Trips will terminate at Seaway TC instead of using the Boeing Perimeter Road and Casino Road (instead served by Route 12). Frequency is improved to every 30 minutes. Route 4: The route is truncated to Everett Station, with trips to the Providence Pacific Medical Center served instead by Route 6. Frequency remains hourly. Route 6: Massive upgrade to all-day service with buses every hour, serving the Providence Pacific Medical Center, the city’s growing waterfront, and the naval base. Route 7: No significant changes. Route 8: The southern half of the route has been streamlined to use Casino Road, Seaway TC, and Airport Road. 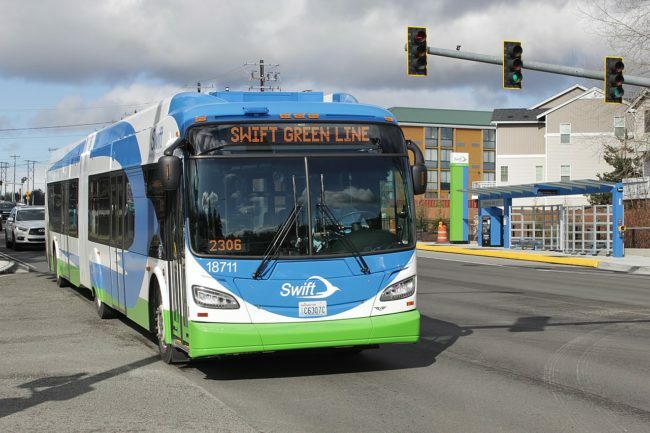 Buses will also serve the front door of Paine Field, in case the 10-minute walk to the Swift Green Line station is unappealing. Service remains hourly, but is upgraded to 40-minute headways during rush hours. Route 12: The circulator is replaced with bi-directional service on Casino Road, with a frequency of 30 minutes. 100th Street and Airport Road are instead served by Route 8. Route 18: Service is cut to peak periods only, with bi-directional service every 30 minutes from 6 a.m. to 8:30 a.m. and 3 p.m. to 6:30 p.m.
Route 29: Route deviations to Valley View and Eastmont Park and Ride are eliminated, while the south side of Silver Lake will continue to be served during peak hours. Frequency is improved to every 40 minutes. Route 70: Truncated to Seaway TC, with an additional stop at Gate E-72 on the west side of the Boeing campus. In addition to the route changes, Everett Transit will also increase fares effective July 1 to $2 for Adults, $1.50 for Youth, and $0.50 for Senior and RRFP holders. Fares on Route 70 will remain pegged to Community Transit’s local fare of $2.50 for adults. Option 3: No changes to the proposed July fares. Community Transit, meanwhile, is proposing a $1.25 fare for local routes and $2.00 fare for commuter routes under ORCA Lift. The proposal could be adopted as early as this Thursday at the agency’s regular monthly board meeting. The Everett City Council will have a public hearing on Wednesday, April 17 before taking action on their proposal. I rode the Swift Green Line southbound from Seaway TC at 4 PM last Thursday. Boeing 1st shift gets out around 3:30, so I was surprised that the bus was empty but for me and the driver. Between STC and Mill Creek there were about 5 boardings. Hoping this isn’t typical. As long as there are no buses/shuttles running through neighborhoods and a lack of decent parking along the routes (unless you want to try to beat countless others to transit center parking at McCollum and presumably Canyon Park), there isn’t going to be a lot of use by anyone not in reasonable walking distance of bus routes. Which is annoying, as there are many of us who would happily use the bus system if we could get to it without sweating up a storm walking miles on hilly terrain or being drenched in rain. Sometimes, as a thought experiment, I imagine that every person in place like Lynnwood were to suddenly decide they wanted to ride transit, and imagine what level of service the transit would need, just to have the capacity to carry everyone. For example, a road that gets 30 cars per minute would need a bus every two minutes, with every trip packed to the gills with 60 people per bus. Even a more road that gets, say 5 cars per minute, could still, in theory, support a bus running every 6 minutes, with 30+ people on board each trip. With no car traffic to contend with, service speed (and bus bunching) would be dictated by dwell time to load and unload passengers, and all of the main roads would likely require a mixture of local and express service to keep travel times reasonable. For example, maybe SR-99 would get both Swift and the 101, each running every 5 minutes. I then Imagine what the taxes would have to be to fund such a service, and what percentage of the local population would have to be bus drivers, in order to operate it. I can easily imagine the taxes to fund the bus service costing similar to what car ownership costs today (given that the land use still makes for very inefficient service). Furthermore, a bus-based system designed to carry 100,000 people at the same time would require hiring over 3,000 bus drivers, which might make the transit system the largest local employer, after Boeing and, maybe, the local school district. It would also require an enormous amount of land to store the 3,000 buses, but I suppose, with all that asphalt not needing for parking any longer, such land would not be difficult to come by. Next, I imagine the effect this would have on the sidewalks. With every person who currently drives to work riding transit, all the sidewalks will suddenly feature a ton of activity – way beyond what nearly all the sidewalks in Lynnwood have the capacity to handle. I imagine hoards of people walking to and the from stop, squeezing into narrow sidewalks, while the 6-lane roadway goes virtually unused. And, of course, if imagine that every person strictly obeys the present law as a pedestrian, they would all have enormous amount of time added to their commutes walking to the nearest crosswalk and waiting for walk signals to cross the street, while no cars go buy. In many cases, the wait to cross the street to get to the bus stop would exceed the time it would take to actually wait for the bus. The whole car-based infrastructure would suddenly look like a gigantic waste of space that slows everybody down and causes everything to be needlessly spread far apart, transforming walking trips into short bus rides, and short bus rides into long bus rides. Without cars it would be a lot easier to make the buses driverless. We don’t have to guess what it would look like; we just have to look at cities the size of Seattle where most people don’t have cars. Or take the situation in 1920 and multiply by the population increase. Since we’re imagining major restructures, let’s add bicycle highways like Amsterdam or former Beijing. 200K then, 730K now. So 3.65. What neighborhoods do you believe are under-served? From what I can tell, between the two agencies, the bus service from surrounding neighborhoods seem to cover most areas (albeit with infrequent service). I’m also looking at parking options, and I can see a few. For example, if I was off SR 524 (Maltby/208th), I’m out of luck for connecting bus service. But I could drive to the bus stop at Thrasher’s Corner, and park in one of the big, generic business lots. Most are not designed for one business, and say nothing about having to be a customer (from what I can tell). They seem designed for the community, and as long as you are parking in a relatively less popular spot, I doubt anyone would bother you. It actually helps businesses, since maybe you stop off to grab a sandwich or some milk after your bus trip. As long as I don’t see a sign, I wouldn’t hesitate. My guess is it is just a matter of folks getting used to this. The people who live around there probable aren’t yet aware of the Green Line, and how frequent it is. Those in surrounding, less populated areas will get the hang of the parking situation, but it will likely take a lot of trial and error. Meanwhile, this isn’t the last change that Community Transit (or for that matter, Everett Transit) is going to make. Right now a lot of the service hours are put into getting to downtown Seattle and the U-District. As that changes, those hours can lead to new routes, including along SR 524. Doing so becomes a challenge, though, given the cul-de-sac layout, and relative sparsity of people. It becomes too expensive to serve each community via direct bus service. That means that a bus would probably just run along the highway, with stops at each connecting road. Building park and ride lots at each of those places (or a lot of those places) would be expensive. Some of the streets are well suited for parking along the side of the road (https://goo.gl/maps/qdEKeTDDN662), some of them aren’t (https://goo.gl/maps/4RSBT1EysUm). In the latter case, sometimes you can contract with a church to provide for park and ride service (six days a week). That gets into the fundamental issue of whether the Green Line was a good idea in the first place, and whether any frequent route in that part of Snohomish County is feasible or whether it’s a futile attempt. I have only been through that area once or twice before the opening so I don’t know. What I see is generally lower density than in King County, and much of the housing is away from the highway so residents would have to content with hills and rain. But I also see dense apartments in Mill Creek, and seven-story apartment buildings south of Mill Creek, the Canyon Park office parks, and the future promise of a Bothell extension. I imagine that people in those apartments will want to go to Boeing, Canyon Park, Mill Creek shopping, and transfer to Swift Blue. I haven’t seen 128th Street yet but I imagine people there want to go to those places too. Aren’t those the primary transit market for Swift Green? So it should get those riders over time. If not, we have to ask whether Swift Green’s promise was feasible in the first place. Somebody in Snohomish County would have to answer that. As to all those houses away from the highway where you have to walk up hills in rain, is there really a better routing that could serve them? All of them? I imagine they’re scattered around like peanut butter, with many of them in cul-de-sacs. A bus that tried to do that would be slow and little-used, because of both the lower speed limits on non-highway streets, the meandering nature of those streets, and the dead-end cul-de-sacs. Any route that did so would inevitably be infrequent. Not every 20 minutes like Swift, but every hour or two or weekday-only. It’s an insurmountable problem of that kind of street layout and land use. Somebody from Snohomish County could say whether there are better routes that buses could take, but for my part I defer to what Community Transit and the cities have decided is the most promising route. But I also see dense apartments in Mill Creek, and seven-story apartment buildings south of Mill Creek, the Canyon Park office parks, and the future promise of a Bothell extension. There are also plenty of apartments along 128th and Airport Way. In general, it is one of the more densely populated routes that you could build for Snohomish County. It also cuts across a fair number of other bus routes, which makes for good connections. This is especially important for a bus that is frequent. It means that a two stop ride is not that bad, as long as you can time the other bus. In general it is about as good as you can do for a low density county like Snohomish. Denise hasn’t responded to my question (about what areas she things should have service) but I can how there are hundreds if not thousands of houses without any bus service. So it isn’t really a weakness in the line, but rather, a common struggle over how to provide service to very low density suburbia. Blue Line ridership took a little while to get going, but CT was reporting that the first two weekdays of Green Line service were above 1,700 riders. Bummer that the 18 will only serve Mukilteo ferry terminal during peak hours. Yeah, when it’s not peak hours, a trip from Mukilteo to Everett would take about an hour, involving a meandering bus that runs once per hour, a transfer in Lynnwood, and a long, long detour. I don’t know if people seriously expect anyone to actually do this. IMHO, the best home for better transit service to Mukilteo is the eventual Paine Field Link Station, which could be just a 10 minute shuttle ride away. Ride now, the demand for an all-day shuttle from Mukilteo to Seagate Transit Center doesn’t rise to the top of the priority list for a cash-strapped agency, but if such a connection were to become *the* way to get to downtown Seattle, the priority would become much higher. My guess is Mukilteo will get better options before then. Lynnwood Link will be a huge game changer for Community Transit. Ridership should increase, while at the same time they will save a fortune not sending buses to downtown or the U-District. I would expect most of the service improvements to be where the people are (not Mukilteo) but they could still afford some improvements in the area. It is a bit tricky given the existing routes. The 113 makes sense in terms of serving people, but it is slow as a way to get from Mukilteo to Lynnwood or SR 99. But it does work as a way to get to 84th, and connect up to the 107. I could see the 107 running a lot more often once Link gets to Lynnwood. That would enable a fast two seat ride from Mukilteo to Lynnwood or the SeaWay transit Center. From there you could catch any number of buses towards Everett. That is a three seat ride to Everett or Seattle, but it would work without a lot of delay. Of course there are possible restructures that could lead to a more direct routing, but I’m not sure any of them could be justified. For example, you could send the 113 to Seaway, instead of Mukilteo. Then send the 107 to Mukilteo, as a straight shot bus. That would be great for Mukilteo, but not great if you are trying to get from Lynnwood to SeaWay. If they did something like that it would have to be part of a larger restructure. Everett Transit complicates things further. Link expansion to Everett does very little for them. Things improve from a very indirect standpoint. As Community Transit gets better routes, they can focus on areas that CT doesn’t cover. Yet they don’t seem to be interested in that. The 7 overlaps the main Swift Line (Swift Blue) quite a bit, yet they run the bus a lot. They don’t seem that interested in complimenting CT, maybe because of their fare structure (some people just prefer Everett Transit because it is cheaper). It is a tough position, just from a fare recovery standpoint. If they focus on serving the areas that CT does not, then they will not get many riders. So they end up poaching some of the CT rides, and doing something a little bit different along the way (e. g. the 7 allows for one seat rides to some Everett locations). Of course it cuts both ways. Since Everett Transit is the one providing local service for SR 99 north of Everett Mall Way, CT doesn’t bother with doing that. The 101 cuts over at 128th. The 18 is somehow considered Everett Transit’s responsibility, which means that Everett hears the complaints, not CT. Getting the two agencies to work together on this is a tricky task, I’m sure. Everett Transit has served the Mukilteo ferry dock since at least the late ’70s. I think the arrangement predates the existence of Community Transit. That’s just amazing. Everett is the largest city in the county, and Mukilteo is one of the closest adjacent towns. From downtown Bellevue in an hour I can get to Renton or Bothell and all the cities in between. From downtown Seattle I can get to Kent and Shoreline. From downtown Kent I can get to all the cities in South King County. Not on weekends. My roommate sometimes meets his dad from Whidbey Island at the Mukilteo Ivar’s. From the 512 there’s only the 46-minute long 113 from Lynnwood. Nothing from Everett. And when I went there the 113 went to Ash Way instead of Lynnwood due to recession cuts. Maybe. That’s the argument for the current routing, which detours to Beverley Blvd and Harbor Pointe Blvd. I’ve never seen many people get on/off it in Beverley Park or Harbor Pointe, at least on Saturdays. It’s one of the difficult aspects of multiple agencies. Seattle Transit used to be separate too, but Seattle is so large and on one side that it wouldn’t matter as much there, although routes like the 5, E, 120, 131, and 132 would have to be cooperative so they wouldn’t be split up or part of them wouldn’t exist. But Everett is a lot smaller and in the middle, so the fact that Everett Transit is separate and focuses on Everett residents means that Mukilteo, which is isolated in one corner around Everett, gets only minimal service from Everett and CT won’t fill in the gap. Fortunately Everett pays CT for Swift Blue in Everett, so that’s something. There are tradeoffs both ways with city-based transit agencies, and these are some of the negative impacts. The problem is that Mukilteo is very low density. Or at least, the old part of town. The only parts of Mukilteo that are even moderate density are those served by the wiggly path of the 113. Everett is nowhere near as big as Bellevue, nor does it dominate Snohomish County the way that Bellevue dominates the East Side. Bellevue has major employment centers as well as density. Downtown Everett has minor employment density, and the population density at best is similar to areas like Lynnwood and Edmonds. A trip from Mukilteo to Everett is more like Woodinville to Redmond. You can get there, but it will take a while. If anything, the case for Woodinville to Redmond is a bit stronger, as Woodinville has a higher concentration of people than the waterfront part of Mukilteo. That being said, Community Transit has been willing to provide low density coverage service. Gold Bar and Sultan are way out there, and pretty small towns. But for those towns — and more importantly, for Monroe — you have service, but it may not be where you want to go. Like Mukilteo to Everett, you would have to take a big detour if you want to get from Monroe to Seattle by bus. So both agencies can basically say the area is “served” even though a relatively high percentage of the trips are rather time consuming. I also think institutional inertia plays a big part. Everett Transit has always made the trip from Everett to Mukilteo. They still make the trip from Everett to Mukilteo. But it is obviously a big money loser — there just aren’t enough people trying to make that trip. Community Transit could add that trip, but they no incentive from a cost perspective and given the history, have little incentive from a political one. As I said earlier though, I could see CT adding more service as they take advantage of the service windfall that will occur when they truncate the buses (following Lynnwood Link if not Northgate Link). If the City of Mukilteo wanted the service provided by Everett Transit bad enough, I think they would need to negotiate a pass-through of a percentage of their PTBA funds (or spend money from their general fund or establish a transit improvement district) to purchase the service from Everett. The way the route travels mostly through neighborhoods in the City of Everett, I doubt there is much incentive for Community Transit to provide the service. These list of route changes are such a slog to read through. Are there maps to compare the old network and new one? I feel like those would communicate the message about what the restructure looks like a lot better than a list of route descriptions. The Everett Transit web page for the changes has a new map, although they list it as “proposed”. They also have a route by route list of the changes (with maps). Thanks Ross. That’s helpful. I was thinking for the readability of the STB articles though. I was suggesting that maps would communicate better the message about route restructures if the authors are able to include them. This should answer the “what neighborhoods” questions above. Also, ET took over the #70 from CT, I think its # then was 177, as part of the agreement with Swift-Blue. It appears that neither Everett Transit nor Sound Transit see the need for regional connections for Everett’s southern residents. The feel I get is that everything is oriented to getting people to Boeing, not from the surrounding area to anywhere else, with the exception of Swift. For instance, ET’s revised #12 goes between Seaway Transit Center and the floundering Everett Mall not to the South Everett Park & Ride, just 1.7 miles and 4 minutes further, where connections to Sound Transit express buses to Seattle as well as the Eastside await…and visa-versa. Imagine how a peak period, both directions #12 Seaway-South Everett P&R would perform. Their lengthy #29, which does go from the mall to the park and ride, is not interlined (a #12 that becomes a #29) and leaves several minutes before the #12’s earliest trip arrives! To the west, the #12 hasn’t started running when the #3 leaves Seaway TC for downtown Everett (the #3 used to go from southwest Everett, the only single-bus connection to the 6 a.m. Sound Transit express buses and the Sounder). You’d have to walk east along Casino Road, and many of you have heard of “the reputation,” and take Swift-Blue. ET abandoned their city’s industrial area along Hardeson Road, with no stops near the corner of 75th at the south end, where the #8 now turns. They’re at least 1/4 mile north from the corner and 1/2 mile or so from the businesses. Instead, they retained service to unincorporated areas and duplicate others’ coverage. Further, ET continues to deadhead their #70 between the Mukilteo ferry and Sounder station (the nearest regional connection to the west), i.e. in the a.m. peak taking passengers up the hill, but taking no passengers and thus running empty the opposite way; the reverse occurs in the p.m. peak. Want to go to Paine Field from southwest Everett? It’s a two-bus ride, no better than someone living in Stanwood, Arlington, or Monroe (who can take an express bus to/from Seaway TC during peak hours). From Mukilteo, it’s three buses, two for some folks if during peak times. ST’s no better: they start the 513 to downtown at Seaway TC, down to Hardeson, south to Casino Road, east to its only stop at Evergreen despite thousands of residents in-between. The double deckers that I’ve seen doing these runs are empty at least all of the way to Evergreen. At least they don’t deadhead from Airport along Casino anymore; you’d think they could at least stop 2 or 3x in this heavily multi-family area that’s designated for further development. Their second stop is the nearly-abandoned Eastmont P&R (ET no longer goes there), which filled about 1/3 when ET went there. They could serve the car-packed South Everett P&R, but said they don’t want to inconvenience a handful of customers and instead get onto I-5 by backtracking from Eastmont. CT doesn’t serve the park and ride either. 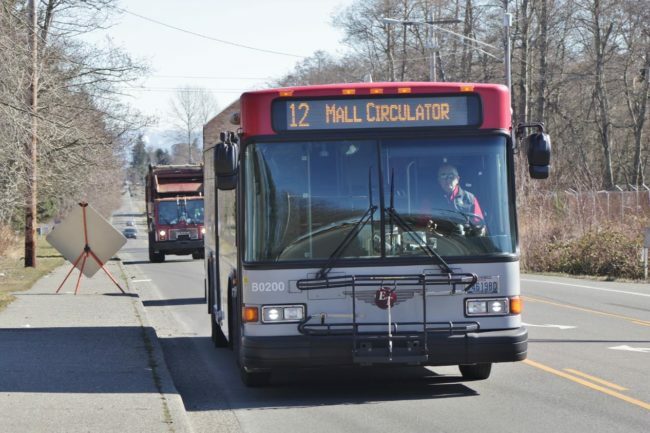 My guess is that Everett Transit will look at the 29 (which serves both the mall and the Park and Ride) and see how many people go the park and ride versus the mall. If the park and ride ridership is even close, then it would make sense to extend a bus like the 12, or better yet the 7. That would cost money, but it would benefit both the riders heading to the park and ride from surrounding neighborhoods as well as those headed to the mall from other places. My guess is there aren’t a lot of people coming in from Lynnwood, but you never know. It wouldn’t surprise me if Everett is giving the Everett Mall too much service relative to how many trips are taken there, but it behooves them to prop up the mall. Not only for the employment that is there, but as a means to generate tax revenue (which helps pay for the bus service). It appears that neither Everett Transit nor Sound Transit see the need for regional connections for Everett’s southern residents. I agree. But Everett Transit really has a different mission. They are largely focused on trips within Everett. Sound Transit is supposed to serve regional connections, but unfortunately, they have largely ignored bus routes like the one you described for the 513. Almost all of there buses end at a park and ride or transit center. Even when they go by a relatively densely populated area (like Casino Road) they fail to serve it. The cost to most riders would be minimal. Eastmont riders aren’t affected. So the assumption is that there will be huge numbers of riders who will instead board at SeaWay. But where are those riders coming from, if not places like those very neighborhoods? It makes no sense, really. It would be like the 41 just ignoring the Northgate neighborhood after the TC, and heading off to … well, there really is no good analogy. The SeaWay transit center sits in the middle of nowhere. There are hardly any houses, let alone apartments nearby. There are jobs, but most of them require a shuttle bus. It is a transit center — but nothing more. But it doesn’t work that well for a bus like the 513, because service to the transit center is not that great. Everett Transit runs buses there every half hour at best. Community Transit serves it much better, but most of those buses are running from the south, or are express buses from the north. That means that the 513 ridership for that stop is based on infrequent feeder buses, people who forgot to get off the bus in Everett (to catch the 510), or folks who decided they wanted to go north before they went south. My guess is ridership for that stop in peak direction (Everett to Seattle in the morning) will be abysmal, making the case for serving the neighborhood along the way stronger than ever. The only real case for serving the Transit Center is for reverse commuters. That being the case, I could easily see the bus running “express” to SeaWay in the morning, but serving Casino Road between SR 99 and Airport Road (like the 12) in the evening. (And the opposite in the other direction). Community Transit also serves regional connections, albeit mostly peak hour express to downtown Seattle. Most of those routes are like the modification we both described. They may end at a park and ride, but along the way they serve people on the street. Some of them don’t even end at a park and ride (shocking, I know). That is the question for transit fans: how well does Everett’s plan meet Everett residents’ needs? All residents need transit to meaningful places, which in practice means the nearest supermarket plaza, shopping center, jobs concentration, and connections to regional transit. In outer areas like south Everett, few of these are within reasonable distance of a local route, so regional connections become an even larger percentage of the total trips. Lower-density peripheral areas will naturally have less service than the core corridors like Broadway, Evergreen Way, Marine View Drive, and wherever else. So the question is, does ET’s plan meet the above goals for south Everett in proportion to the area’s density? Or is the service lower than that and missing low-hanging fruit destinations? Does the network serve south Everett residents, or is it really oriented toward getting the rest of Everett to Boeing? That issue is similar to VTA light rail in Santa Clara. It goes from the center of San Jose and southern residential area to the office parks on Tasman Blvd in Santa Clara (many tech headquarters). But the bulk of Santa Clara’s residents live a mile away in other corridors, so it doesn’t serve them. I saw Tasman Blvd when it was built in the around 2000: there was nothing there: the train went to apparently nowhere. So all those office parks were built afterward. So the primary transit market was from San Jose residences to Santa Clara jobs. (It does have other markets now, such as connecting to Mountain View and Caltrain, and Milpetas to the east, where there’s an express bus to Fremont BART.) Maybe it was the right call to serve San Jose workers. But it seems to shaft Santa Clara, when it could have connected to all-day bidirectional demand between San Jose and Santa Clara. Is this similar to Everett, with ET focused on taking commuters to Boeing and not serving south Everett residents very well?